Millions of people want selfies riding elephants, or washing them, or patting their trunks. But according to a study carried out by World Animal Protection (WAP) across Asia this is helping to fuel a rise in elephants captured from the wild and kept for entertainment. The number in Thailand has increased by almost a third over the last five years. WAP researchers assessed almost 3,000 elephants and found that more than three quarters were living in "severely cruel" conditions. Many were bound with chains less than 3m long and were forced to stand on concrete floors close to loud roads, crowds and music. Some 160 travel companies have already committed to stop selling tickets to or promoting venues offering elephant rides and shows. In 2016, TripAdvisor announced that it would end the sale of tickets for wildlife experiences where tourists come in to direct contact with wild animals, including elephant riding. 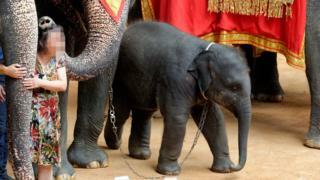 Dr Jan Schmidt-Burbach, Global Wildlife and veterinary adviser at World Animal Protection (WAP), said: "The cruel trend of elephants used for rides and shows is growing - we want tourists to know that many of these elephants are taken from their mothers as babies, forced to endure harsh training and suffer poor living conditions throughout their life. "There is an urgent need for tourist education and regulation of wildlife tourist attractions worldwide. Venues that offer tourists a chance to watch elephants in genuine sanctuaries are beacons of hope that can encourage the urgently-needed shift in the captive elephant tourism industry." This research was carried out between November 2014 and May 2016 across all venues that could be identified in Thailand, Laos, Cambodia, Sri Lanka, Nepal and parts of India. After inspecting 220 venues and 3,000 elephants, they found only 200 to be living in acceptable captive conditions. These were where there was no direct interaction with people: no rides; no washing of the elephants; no circus tricks. Image caption A wild elephant would never normally let a human ride on its back or perform in shows. According to the WAP report, Thailand uses roughly twice as many elephants in tourism as all the other countries combined. Over five years, the number of tourists visiting the country doubled to more than 30 million (2016 figure). The research found that 40% of tourists of the top nationalities visiting said they had been or were planning to ride an elephant, so captive elephants in Thailand gave rides to almost 13 million people last year. The vast majority of these elephants are captured from the wild. The WAP report says that harsh methods are used to get a wild elephant to carry a human on its back. The process starts soon after it is captured. It is often referred to as "breaking-in " or "crush". Their handlers - mahouts - are dependent on the animal for their livelihood. The report finds that mahouts also endure "unacceptable" living conditions and earn poor wages in many of the elephant camps. Asian elephants are considered endangered by the International Union for Conservation of Nature (IUCN). They are also on the CITES list of endangered species. According to a 2013 report from the monitoring network Traffic, many of the elephants used in the Thai tourist industry were captured in neighbouring Myanmar. It's estimated that each one can fetch up to $60,000. They are smuggled across the long and porous border. Here the capture of elephants is considered a serious threat to the country's wild population. Daniel Turner, Associate Director for Tourism at Born Free told the BBC: "Riding an elephant still features on many people's bucket list when visiting Asia and, more recently, Africa. While some may consider riding on top of the largest land mammal to be a cultural experience that holds an air of romance, few recognise that this practice actually significantly compromises the welfare of these magnificent animals and potentially places people at risk. "Riding or interacting with captive elephants, swimming with dolphins, walking with lions, or cuddling a tiger cub for a photo - these are just some of the many worrying tourism excursions and activities involving animals. All can impact on the welfare of the animals involved, and risk people's safety." The WAP report says that there are a small but growing number of venues where elephants are kept in more humane conditions. They call themselves "rescue centres" or "sanctuaries". In Thailand they are mostly in the north, near Chiang Mai. The report concludes that the way forward is to support and replicate these places - where people are kept far enough away just to observe. Thailand is also making moves to help improve the conditions of captive elephants. In 2016, it set up an elephant database, and has strengthened the policing of its border with Myanmar.